How can ANYBODY think that the world is FLAT and UNMOVING in THIS day and age?? People have KNOWN that the Earth is a ball whirling about madly through the infinite void with its thin skin of air clinging tenuously thereupon in spite of ALL evidence that our senses give us to the contrary… for AGES! Like, FOREVER!! 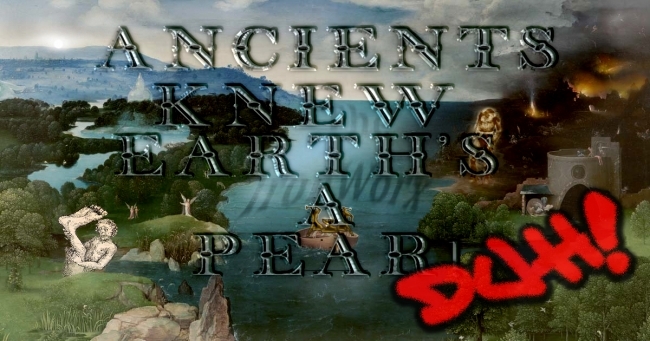 Some Greek dude had some Greek sticks, a well, and APPARENTLY a cell phone…he thunked it all out…then an apple hit his head…there’s ya gravity right there…stop thinking like a troglodyte, get with the PROGRAM, Earth is a Spinny Space Pear! — NASA asteroid WARNING: Three giant space rocks skim planet Earth TODAY! Wake the kids! Call the neighbors! THREE massive asteroids barrelling through space will skim the planet today in a so-called Earth Close Approach, space agency NASA revealed. Or not. –SpaceX will send Japanese billionaire Yusaku Maezawa to the Moon! “I choose to go to the Moon with artists!” I Paid big bux! I hope Elon “Dank Bud” Musk isn’t scamming me for my money! Like he did those folks who already paid to go to space THIS year…hmm. –Kneel In The Grass Tyson says do NOT smoke weed in space…unless you’re Elon “Stanko Danko” Musk…then, by all means, blaze! GO TEAM ELON! –Google is all up in your phone settings…and your mind!! Changing BOTH! !